You have read about how I raved about the Bhutanese meal served onboard Druk Air. Now let me provide you with a quick introduction to Bhutanese Cuisine on land – just remember one fact: Bhutanese LOVE Chilies! There are dishes where chilies are the main ingredients and dishes where chilies are the only ingredients! If you don’t like chilies, learn this phrase: “nga zhego ema dacikha miga” which means “I don’t like food with chilies”. Actually if you really don’t like chili, you don’t really have to learn to pronounce the above phrase (who knows – you might even end up pronouncing it to sound as if you love chilies! :-)). The fact that you are on an all-inclusive travel package means that the food you will be having in hotels or restaurants will most likely be toned-down Bhutanese fare which is mixed with continental Indian and Chinese dishes, so as to suit the palate of tourists. If you have any special dietary requirements, your guide will most likely be there to assist you. Bhutanese meals are characterised by the hot chilli pepper and cheese; put them together and you have the national favourite – Aema Datsi (literally chilli and cheese). This main dish has spun into numerous variations: Kewa Datsi (potato and cheese), Shamu Datsi (mushroom and cheese). These would be standard fare in most Bhutanese restaurants, but do tell them how hot, that is how much chilli you can take in your meal. There are 2 things you need not worry about when travelling in Bhutan (even more so if you are used to Singapore food) – One, You will Never get Hungry and Two, Local food taste pretty much like back home e.g. Chinese food (except with a bit more cheese and chili). Lunch will typically be in restaurants (depending on your journey around Bhutan) and 5-6 dishes will be served – chicken, vegetables, pasta cooked with cheese, potatoes, rice and of course chili cheese! There will be enough to go around during each meal (often too much). As you can see in the picture below, it is pretty much what we typically eat in Singapore – no surprises (except perhaps for the chili cheese which is hot and tastes *erm… well… cheesy!*). Bottled water will also be served (included in the tour package). For juices, beer and soft drinks, check with your tour guide if its included in the package. Dinner is typically served in the hotel restaurants where you will most likely get the same Bhutanese fare – similar to your lunch. Very few hotel restaurants serve ala carte meals so they will usually wait for the group to get together before they serve the “buffet” style meals i.e. 5-6 dishes served in big bowls with a serving spoon each. 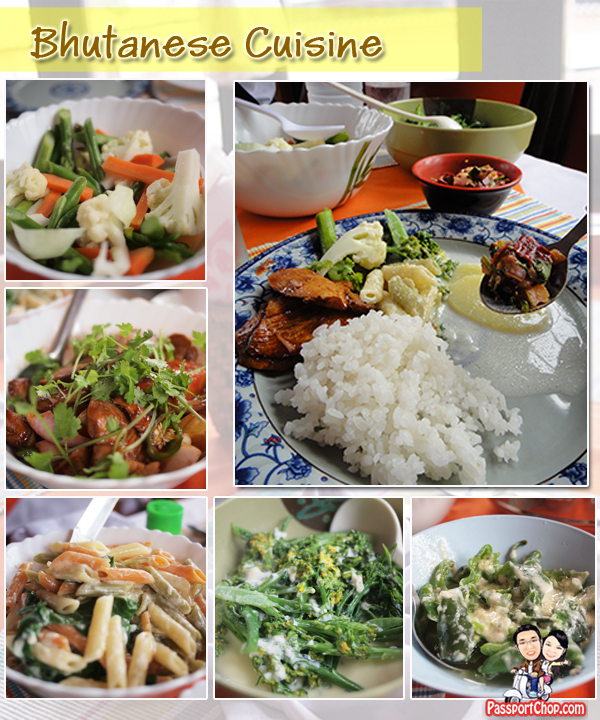 Most of the food taste good because they are locally produced organically. However, do note that fish is imported (since Bhutan is a landlocked country) from neighbouring countries so dishes with fish are not as tasty as what you might get back home. Breakfast is usually served ala carte with choices of western dishes as well as local noodle dishes. Omelettes, scrambled eggs are usually available upon request. 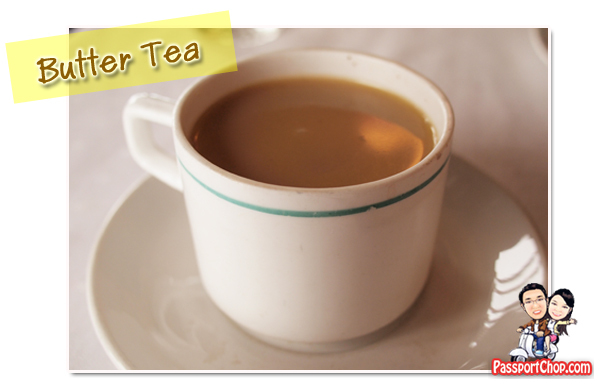 The Butter Tea is also one of the unique teas served in Bhutanese restaurants. It tastes *erm… well… buttery! * The butter taste is very strong and overpowers the tea leaf smell and at times, it feels like drinking butter but it tastes great! 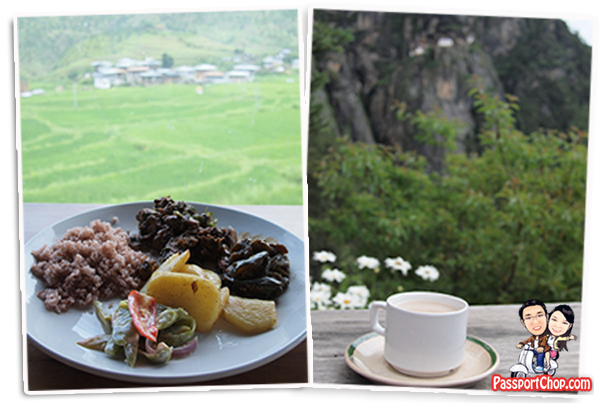 Besides enjoying Bhutanese cuisine and its spiciness, sometimes dining in restaurants outside come with another perks – excellent views of the surroundings that makes all the whole dining experience even more enjoyable! For example, the Chimi Lhakhang Cafeteria (see picture on the left) has ceiling to floor windows which offers guests with a great view of the Chimi Lhakhang temple and its surrounding rice padi fields while having lunch. The Taktshang Cafeteria offers great views of the Taktshang Goemba – Tiger’s Nest Monastery while you are resting with tea and biscuits before you attempt Stage 2 – a steep climb up to the monastery. I am doing some research for our next trip and found your post. You have answered many of the questions and myths about Bhutan. My husband and I operate a Bed & Breakfast in Canada called Villa Lucera. We travelled last year to India & Sri Lanka and prior to that Thailand and Myanmar. Hopefully next trip Vietnam, Loas, Singapore and Bali. I will check your other posts as they may offer insight into these countries. I found that your articles were very well written. I also appreciated the photos of the hotels and food. I am hungry now for some spicy food. I am a retired chef and enjoy interesting food experiences. Haha, the whole cuisine sounds like eating chili with a bot of chili on top. 🙂 Just kidding, the dishes on the pictures look delicious, but I have not seen too much meat mentioned. 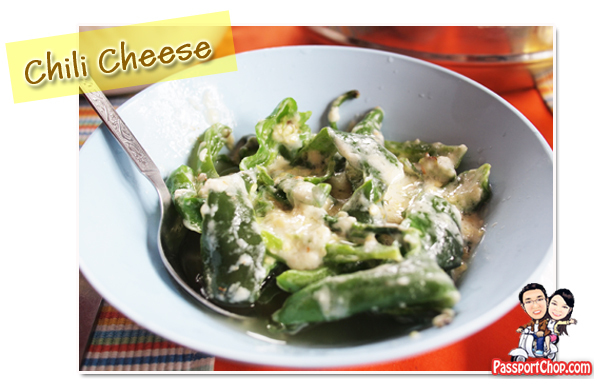 Do Bhutanese people eat mostly vegetables and cheese? What kind of meat do they prefer – if any? There are meat too – Chicken is quite common there. I don’t ordinarily comment but I gotta say regards for that post on this one. 11. And any other important information you would like to share related to Bhutan and Buddhism which can helpful for my Project. Someone Please help me to get information about these above points. Unless until I get sufficient information, I can’t start my Project for my Final year Studies.. Please please please Help me…. I need these as soon as possible. Note: Information related to Bhutan Tradition and Culture only. (Don’t need information of any Contemporary and western traditional item Used)…. Thnk you very much for Co-operation and for Information in advance.